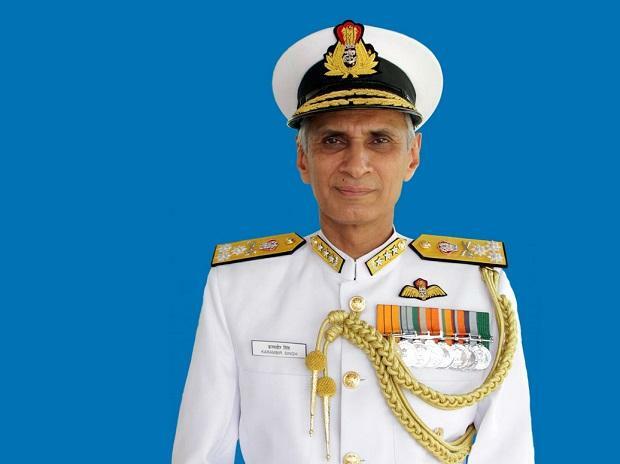 Setting aside the principle of seniority, the government on Saturday named Vice Admiral Karambir Singh as the next chief of naval staff (CNS). The current CNS, Admiral Sunil Lanba, who is due to retire on May 31, will hand over charge to Singh on that day. Singh, from the 1980 batch, will supersede Vice Admiral Bimal Verma, the current Commander in Chief Andaman & Nicobar (CINCAN), who was commissioned in 1979. Verma is the younger brother of Admiral Nirmal Verma, who was CNS from 2009-12. With the chief of army staff General Bipin Rawat having superseded two of his seniors while being appointed army chief, this will be the first instance since independence that two of the three service chiefs will be the government’s chosen men. No air force chief has been appointed through supersession. The army has had just one supersession before Rawat’s appointment — when General Arun Vaidya superseded Lieutenant General S K Sinha in 1983. Verma’s supersession was anticipated within the New Delhi grapevine. Since February 2016, he has remained in the smaller and less consequential Andaman and Nicobar Command (ANC), even as his juniors were given command of the navy’s two main commands. In October 2017, Singh was appointed chief of the Visakhapatnam-based eastern command and, in January, Vice Admiral Ajit Kumar P was placed at the head of the Mumbai-based western naval command. Verma’s chances were reportedly undermined by the navy’s infamous “war room leaks” case in 2005, when he was principle director of naval operations. His proximity to the case earned him a Letter of Displeasure, while three of his subordinates were dismissed from service. However, a Letter of Displeasure is valid only for a limited period of time, and Verma was duly promoted from commodore to rear admiral and then vice admiral, at which rank he was also cleared to head the ANC. It remains unclear whether the Letter of Displeasure was now used to deny Verma the CNS position. Within the naval fraternity, which sets great store by seniority, there is lingering unease about this supersession. “While appointing a service chief, the existing fleet commanders-in-chief should be superseded only for very good reasons. I presume the government has such a reason. In any case, supersession should be an exception, not the norm,” said former navy chief, Admiral Arun Prakash. Karambir Singh’s career record has been unblemished. He has served as a helicopter pilot, flying the navy’s Chetaks and Kamov choppers. While several aviators have been CNS, Singh is the first helicopter pilot to head the navy. Singh has also held four sea commands, including skippering a Coast Guard patrol craft, INS Chandbibi, the navy’s missile vessel INS Vijaydurg, and two destroyers — INS Rana and INS Delhi.